The company has achieved ISO 9001:2015 certification, a vote of confidence for the organization’s continuous improvement and dedication to customer satisfaction. The ISO certification process is just one more way to ensure our customers continue to receive the highest quality products and services that they have come to expect from Garland. 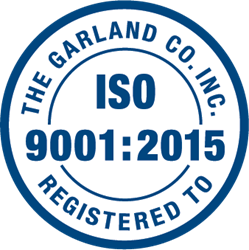 The Garland Company, Inc. – a worldwide leader in the manufacturing of high-performance building envelope solutions – was recently recertified as an ISO 9001:2015 company. ISO 9001 monitors Garland’s ability to consistently meet pre-established standards for quality in the areas of: research, production, quality control, and services related to our building products. Voluntary for companies to pursue, ISO 9001 certification is a global standard for evaluating a company’s quality management system. In 1994, Garland was one of the first commercial roofing companies in the world to be certified by ISO and has maintained its status since. Now more than two decades later, this recertification signifies to Garland customers and industry partners that the company has maintained its commitment to strict quality control and excellence. The International Organization for Standardization, based in Geneva, Switzerland, is an independent, non-governmental organization that ensures products and services are safe, reliable and of good quality. The Garland Company, Inc. is one of the worldwide leaders of quality, high-performance roofing and building envelope solutions for the commercial, industrial and institutional markets. For over 120 years, Garland has continually developed unique product and service offerings that have raised the bar of performance while exceeding the individual needs of customers throughout the world. Today, our network of over 200 local building envelope professionals is strategically positioned throughout the United States, Canada and the United Kingdom to provide quality building envelope solutions for single and multi-property facilities. The Garland Company Inc., headquartered in Cleveland, Ohio, is an ISO 9001:2015 certified company. For more information, visit http://www.garlandco.com or call 800.321.9336.